The Florida Vacation that has it all! Cocoa Beach is one of the original tourist beaches in Florida, and as the concept implies, it has more to do then just your average beach activities. Still it is a great family beach with lots of fun. Most people visiting here fly into Orlando and then drive over. The beaches are about 30 miles due west of the airport. You can leave the airport, get on SR528, and be in Cocoa in 30 minutes. Cocoa Beach, like many of the Atlantic beaches, is known for great surfing. In fact, it is considered one of the great American surf beaches. 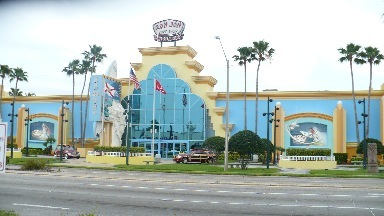 So much so that the first of only 2 world famous Ron Jon’s Surf Shops is located here (the other is actually in Orlando). A trip to Cocoa would not be complete without a visit to Ron Jon’s. When you vacation on one the Florida tourist beaches, you have many great adventures waiting for you. Besides surfboarding, bogey boarding, and body surfing, there are vendors on the beach ready to help you really get you blood flowing. Jet skiing, windsurfing, even parasailing is available right there on the beach. 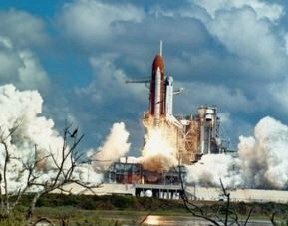 In addition to all the beach fun here, just a few miles north of is the Kennedy Space Center. The beach is so close it serves as a grandstand for rocket launches. Watching a rocket go roaring into the sky just a few miles away, is absolutely awesome. Our family has even stood in the ocean and watched a shuttle launch. Talk about cool!! If you’re lucky enough to be there for a night launch, they are even more spectacular. If you want to take it a step further, the space center has a museum and tours of the facility available, which is well worth the experience. Another aspect of Cocoa Beach is the Cruise Industry. There are tons of cruise line that call Cocoa home. Carnival Cruises, Royal Caribbean, even Disney has cruise ships that call Cocoa their home. Having these Cruises available offers you a whole other possibility for a vacation activity. Can you imagine an Orlando Attractions/Tropical Cruise combo for a vacation? One of my recent visits to Cocoa Beach was because 2 of my sister-in-laws were doing just that. They live in the Midwest, and one of them had earned a cruise for 2 through her Pampered Chef business. Of course, they flew into Orlando to visit with us, so a day or two before their ship sailed we all went out to Cocoa, got a couple of hotel rooms, and stayed there at the beach. On the day their ship sailed, we drove just a couple of miles, drop them off right at their boat, and drove back to Orlando. They had a terrific time, and we snuck in a couple of days at the beach. If the idea of a combination vacation sounds like a great idea, and it should, contact the folks at Seaward Travels . 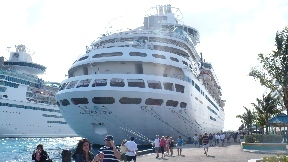 They are located in Central Florida, and are top-notch experts on cruises, especially those porting in Florida. If all this is not enough, you are only 30 to 45 minutes away from all the Orlando attractions, where you can find more to do then your mind could possibly imagine. For more info on this, see our Orlando Beaches page.